A Melbourne design and building firm has been awarded an Innovation Voucher by the Victorian Government and will use it to further their development of an energy efficient modular design and construction system. Comprising a variety of architects, builders and engineers—including BKK’s Tim Black and Chris Barnett of Third Skin Sustainability—Habitech Systems has received a $22,520 Business Research & Development Voucher that they will use to advance and test components of their single panel modular construction system. Habitech’s modular system delivers the structure, bracing and insulation of a building’s exterior envelope in one panel that can be hand-lifted and installed, and they say that a portion of the hand-out will be devoted to developing a similar flooring component. The panels are a prefab composite timber/Magnesium Oxide board solution that have a foam core of expanded polystyrene (EPS). 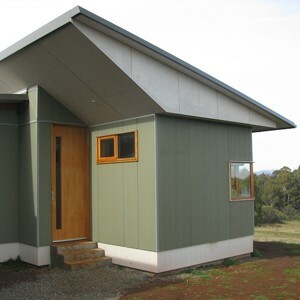 The boards are locked together much like a standard Structural Insulated Panels (SIPs) system, and form a sealed external shell for the building. The system, says Habitech, reduces the materials, labour and time required to complete the outer fabric of a building, and performs better in terms of insulation and energy performance than predictions from energy rating software. “We’ve been keeping our heads down while proving the benefits of our modular design and delivery approach, but we now have eight projects finished and are excited by the performance we’re achieving,” said Habitech Managing Director, Chris Barnett. Habitech’s one-stop business model sees complete control and monitoring of their modular panel’s design, manufacturing, site delivery and assembly. Their system, says Habitech, comprises materials with low carbon emission, produces 30 per cent less waste, is erected faster, and reduces heating and cooling cost by 70-80 per cent. The price of a Habitech home is also relevant to a large proportion of the Australian home purchasers. The Technology Development Voucher is awarded by the Victorian government to commercially focussed projects involving the substantial development/and or absorption of industrial biotechnology, small technologies or advanced information and communication technology. The internal temperatures of Habitech’s Alpine House project in Mansfield, Victoria were monitored over a 6.5 month period and compared with the energy modelling predictions from both regulatory and more advanced software. The house maintained more comfortable temperatures than predicted by the energy rating software, particularly throughout the predominant winter season.